Welcome to our Tips and Tricks page. Here you will find helpful pointers and advice for working with the patterns on your loom. Our site offers an easy to use search box at the bottom of each page. Type in your favorite color to see all patterns with that color. Type in part of the pattern, for example "dou" instead of "double", and it will still find all occurrences of "double". Leave it blank, and it will find every pattern we have on our site. Some patterns are too short to fit comfortably onto the wrist, so they are made longer using an extension. Many tutorials show a simple Single pattern for the extension. 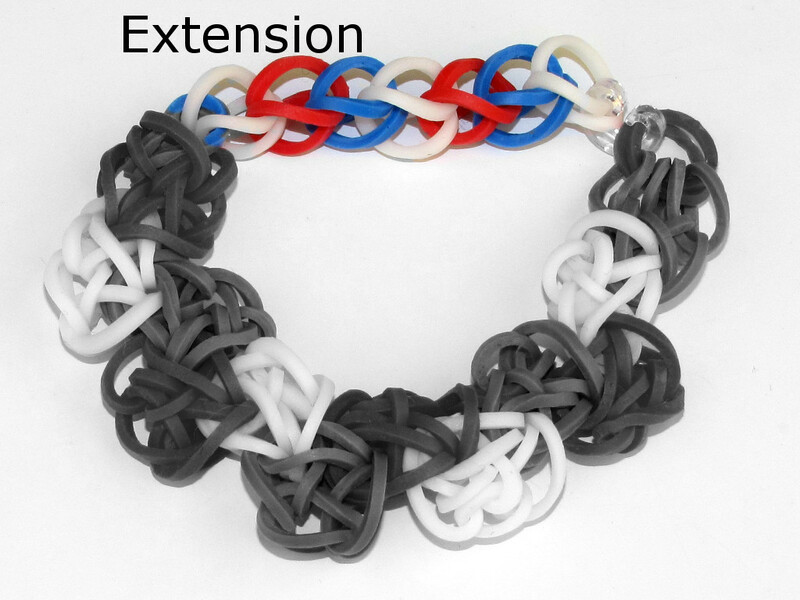 A Single pattern for the extension helps emphasize the main pattern of the bracelet because the single bracelet pattern doesn't stand out too much. It is also easier to modify if you need to make the bracelet longer or shorter. However, other patterns can be used for the extensions as well, such as the diamond pattern. It is also possible build the extension by re-looping your pattern onto the loom, and making the pattern longer. The colored portion of the image is the extension. In all our videos where an extension is required, we utilized the single pattern. Some patterns can be made into All-Around bracelets. These have the pattern go completely around the wrist. Some bracelets, such a fishtails, are classified as all arounds, but others, such as the All Around Triple Single is a pattern which does not need an extension. Similar to necklaces, many patterns can be adapted to be made into rings. A pattern can look completely different if a different sequence of elastic bands are used. Try experimenting with different sequences. 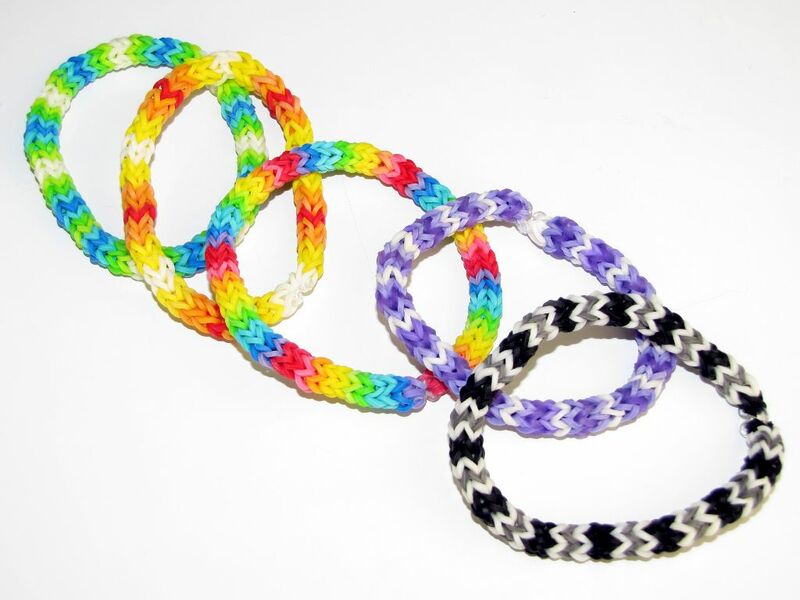 The below figure show the same pattern, the 4 Pin Fishtail Bracelet, with different sequences of elastics. Try different colors, or repeat in different orders as well. Some patterns, such as the 4 Pin Fishtail are made so the pattern flows off of the loom. These patterns are not limited to the size of the loom, or the number of looms a person has. These patterns flow off of the loom as more elastics are being added. This type of pattern typically has the elastic(s) added, and looped right away into the design. There are many tutorials on the internet on how to create various patterns. All it takes is to miss one loop, one band placement, and the pattern will fall apart when it is pulled from the loom. Have patience and try it again. With some of the advanced patterns, it could take a couple of tries before the techniques or moves are mastered. Before starting a pattern, you will need to know if you have enough elastics to finish your work, or which color elastics you will use. If you have your elastics pre-sorted by color, it makes it so much easier. Check out our storage case recommendations. There are over 23 different Looms to choose from. Some patterns ask that the loom be adjusted to a grid pattern to create the pattern. But some looms are not adjustable. Not to worry - just continue with the pattern working with the pegs starting from the bottom. The bottom pegs of each column would make row 1, the next pegs in each column would be row 2, and so on. When placing the elastics, it may not look the same in the videos, the final pattern will be the same. Read the article about the longevity of rubber bands. For long term storage of your rubber bands and jewelry, store the items in zip lock bags out of the sun.